The essay 'Are Mormons Christian?' was added in the topical guide of the LDS.org website in January 2014. The essay discusses the concept of being a Christian from an LDS perspective. It is found here: Are Mormons Christian? The criticism that Mormons may not be Christian does not come from the current wave of people leaving the LDS Church over historical issues. 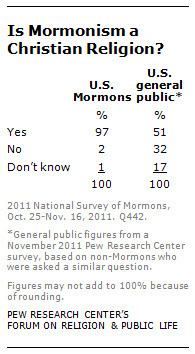 They may not believe the LDS Church is the one true church any longer but most still believe it is a Christian church. The criticism also does not come from the majority of knowledgeable critics of the LDS Church. It is primarily the evangelical churches that take issue with labeling the Mormon Church as Christian. Note: the question raised in this essay is "Are Mormons Christian?" The better question is "Is Mormonism Christian?" Mormon Research Ministry - Are Mormons Christian? All of the contributors to MormonThink either still are or have been members of the LDS Church. We grew up in the Church and we can certainly answer this question as well as anyone. The answer is yes, of course Mormons are Christian in the sense that they believe Jesus was the Messiah and redeemer of the world. We accept that not all religions have the same definition of what a Christian Church is, but in our opinion, the Mormon Church is a Christian Church. For those members who have left the LDS Church and attend other Christian Churches, the most noticeable difference they often cite is that the mainstream Christian Churches focus purely on Christ, while the LDS Church divides it's emphasis between Christ and teachings of modern-day prophets. Also, mainstream Christianity pushes people to develop a personal relationship with Christ while that kind of thinking is discouraged by the LDS Church. It seems that the LDS Church used to be very proud of its unique doctrines and beliefs—the very things that make it distinctive. One of the things they tout is the teaching that God still reveals His will to the people of the earth through the prophets in the LDS Church. However, the Church is drifting towards trying to appear more mainstream by altering some of its beliefs, practices and policies instituted through those prophets, such as abandoning polygamy, ending the priesthood ban to blacks, de-emphasizing teachings that God was once a man, etc. This is very evident in political campaigns where Mormon candidates do their best to appear to have very mainstream Christian beliefs and any uniqueness in beliefs is not discussed publicly.